Who is your favourite member of the Monty Python team? Who is your favourite comedian from the Monty Python team? 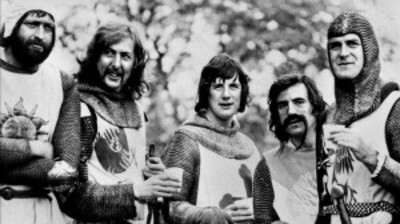 Graham Chapman, John Cleese, Eric Idle, Terry Jones, Michael Palin or Terry Gilliam; and why? Michael Palin. I don't know why exactly. I suppose he's just so likeable. That would have to be john Cleese however it is a very difficult question, as I just love this show and many of the people in it! It's not a dead parrot"
Johne Cleese because he is the only one I am familiar with. It can only be John Cleese! I did see JC on stage when he last toured here. I enjoyed it, & good to see him 'live', but I wouldn't go again. Would you welcome a return for The X-Files? What did you think of Doctor Who Series 8? What is your favourite Blackadder series? Will you watch the Game of Thrones leaks? What do you think of the new Star Wars trailer?